Voice-over artist Harry Moore is falling for his contractor. Can he win Diego’s heart and be his client at the same time? Voice-over artist Harry Moore has decided to take his business to the next level by hiring contractor Diego Ramos to renovate his San Francisco loft into a state-of-the-art home office and recording studio. They hit it off immediately and Harry is soon hoping to make their business relationship a little more personal, but Diego has responsibilities to consider before he can date anyone, especially a client. Can Harry and Diego design a sound future for themselves? I really enjoyed this story as a quick, well written story. It would’ve been higher rated, however, I have to admit that the only thing that was quite memorable about the book to me is Harry’s occupation. There is a sweet, building romance mixed in with a bit of construction and work on either side. I like the fact that being a single dad didn’t really make an impact since so many times its a deal breaker or changes a budding relationship. Overall, it was a really smooth read that was enjoyable. However, I enjoy a bit more turmoil or specifically something memorable in the story. 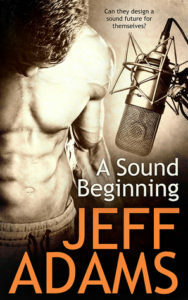 Jeff’s written stories since he was in middle school and became a gay romance writer in 2009 when his first short stories were published. Since then he’s written several more shorts and novels, including some in the young adult genre, and he plans to keep writing as long as wonderful readers keeping picking up his books.